Secretary of HCMC Party Committee Nguyen Thien Nhan and chairman of the city People’s Committee Nguyen Thanh Phong yesterday attended a workshop on Public Private Partnership (PPP), co-organized by the people’s committee and the World Bank (WB) in Vietnam. The event was also attended by director of WB’s country director in Vietnam Ousmane Dione; representatives of ministries, agencies and domestic and foreign businesses and experts. They talked about solutions to efficiently use state budget; shared international experience in PPP investment and strategies to mobilize private capital in infrastructure development and supply of services in health, education, solid waste and wastewater treatment and anti-flooding fields; discussed legal framework and relevant regulations to speed up PPP investment efficiency; exchanged strategies to enhance the private sector’s attendance in service supply and infrastructure development in the four above mentioned fields. 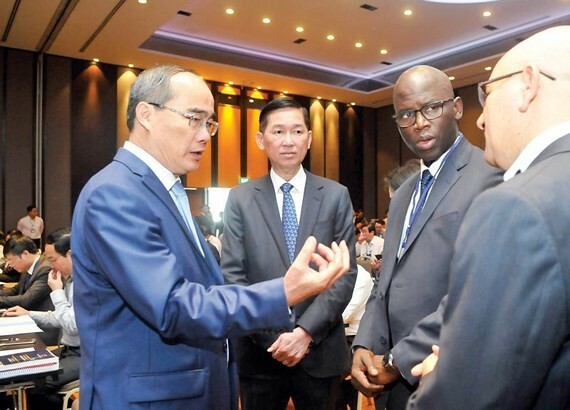 Stating at the event, chairman Nguyen Thanh Phong said that yearly the city spends VND30 trillion (US$1.29 billion) budget funds on public investment meeting only 18 percent of the city’s investment demand. In front of challenges from fast urbanization, problems in traffic, health and education infrastructure and environment; calling for social investment is the most efficient capital raising method. Of these, PPP will mobilize an amount of funds triple public investment and better promote resources from private sector to best serve residents’ benefits. Through the seminar, the city wants to make clear the role of authorized agencies, profit distribution and risk sharing, selection of qualified and strong financial investors, efficient management ways to enhance transparency and prevent corruption, he said. Referring to risks, Mr. Ousmane Dione said that to make it successful, PPP should be recognized as a long term cooperative model in which both public and private sectors share not only profit but also risk. If profit and risk are not allocated equitably, failure possibility will be highly likely. That requires clear legal framework, regulations and institutions so that investors will be able to accept risks in long term with risks being taken into account. Mr. Sebastian Eckardt, the World Bank’s Lead Economist for Vietnam, noted that transparency and efficient financial management are two matters helping the city develop sustainability. Senior counsel of WB Victoria Delmon specified that corruption and unstable policies are sensitive issues in need of being cleared to lure investors. In addition, she said that transparency is a current limitation which should be solved to attract investors. Deputy director of the Department of Planning and Investment Le Thi Huynh Trang said that social investment capital is expected to approximate US$78.5 billion in the phase of 2016-2020, up 53 percent over the previous five year phase. Of these, investment from the public sector is expected to reach $16.2 billion, accounting for 20 percent of total; non-public sector hit $48 billion making up 61 percent and foreign direct investment (FDI) reach $14.3 billion accounting for 18 percent. For the last three years, social investment capital was estimated at $48 billion only. As a result, budget capital demand must be $14.7 billion to fulfill the socioeconomic development plan in the phase of 2016-2020. However, the state budget is able to supply $7.41 billion accounting for 52 percent of demand. 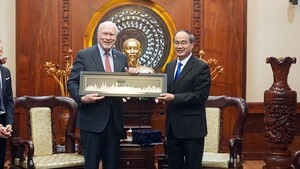 Therefore, HCMC will apply some mechanisms and solutions to speed up PPP in the upcoming time. For instance, it will improve legal framework on investment management under PPP model, build investment incentive policies, mobilize resources such as land and state own houses to create state capital contribution in PPP projects, supply a list of projects calling for investment under PPP model and propose mechanisms to support Official Development Assistance (ODA) in combination with PPP. Secretary Nguyen Thien Nhan proposed the city People’s Committee to change the way of doing in PPP form of investment by telling their need and proposing projects for investors to consider participation. After having the list of to do projects, the city Government should divide them by groups comprising wastewater, hospitals and traffic infrastructure. In each group, there must be experts from the Government to work with experts of investors and businesses to specify contents of a PPP contract for a project rather than using a common contract for all projects. Deputy chairman of HCMC People’s Committee Tran Vinh Tuyen frankly admitted that the city has faced lots of challenges and difficulties in PPP field. They comprise legal institutions to limit risks for investors; risk and success allocation in projects between the state and businesses; transparency in auction; mobilization of land and human resources to prevent loss and waste; incentive policies for businesses; responsibilities of each agency in choosing fields for the best performance of PPP form and public investment targets. He pledged that PPP implementation in the upcoming time will make sure transparency, publicity and risk as well as success allocation with businesses.